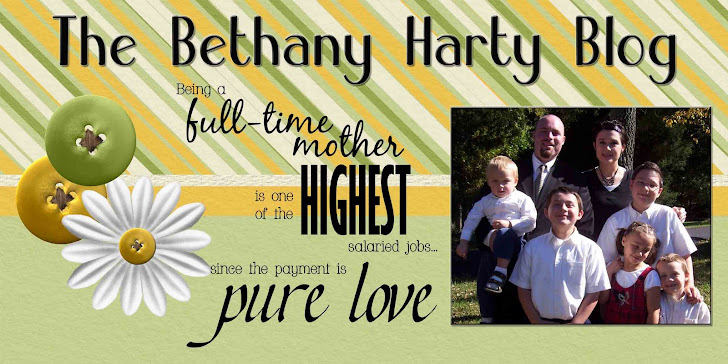 The Bethany Harty Blog: Home At Last! Brent finally made it home! Yah for me. I was expecting him at 4pm, and he showed up at 1pm. Even better! When the boys got home at 3:30, we started to load up for an evening out. We went to Old Country Buffet for dinner. The kids had received free dinner coupons from school and the community fair from last week. It's not too bad to eat out when you only have to pay for 2, instead of 7! Jimmy, of course, fell asleep on the way there. He we laid out coats on the floor, and he slept through the entire dinner. About 10 minutes before we were ready to leave, he woke up. Good timing. Just in time for some Mac and Cheese, Fruit Cocktail, Cottage Cheese, and Cheddar Cheese. After we left Toys R Us, we decided to go to Deals for a Dollar, and get the kids each a toy. Toys R Us is way too expensive. Tom and Jake both got dart type guns, Eme got a magnetic horse playset thing, Joe got a sword with sound effects, and Jimmy got a dinosaur. I got some earrings. It was a pretty fun trip, but the most fun part was having Brent back home!